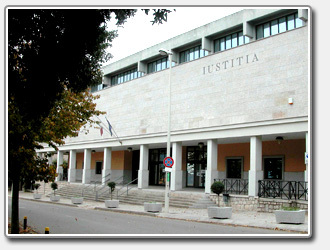 SI COMUNICA CHE IL TRIBUNALE DI TEMPIO - SITO NEL PLESSO DI VIA LIMBARA - RESTERA' CHIUSO FINO A GIOVEDI' 12 SETTEMBRE 2013, PER COMPLETARE LE OPERAZIONI DI PULIZIA DEI LOCALI. LE CANCELLERIE RIAPRIRANNO REGOLARMENTE AL PUBBLICO VENERDI' 13 SETTEMBRE 2013. LE UDIENZE FISSATE FINO AL 12 SETTEMBRE 2013 SARANNO RINVIATE D'UFFICIO E RIFISSATE AD ALTRA DATA, DELLA QUALE SARA' DATA COMUNICAZIONE ALLE PARTI E PUBBLICATA SUL SITO WEB DEL TRIBUNALE. I TERMINI DEGLI ATTI IN SCADENZA NELLE GIORNATE DA LUNEDI' 9 SETTEMBRE A GIOVEDI' 12 SETTEMBRE SARANNO PROROGATI AUTOMATICAMENTE E RIPRENDERANNO A DECORRERE DA VENERDI' 13 SETTEMBRE 2013.